With Tiberius‘s departure, succession rested solely on Augustus‘ two young grandsons, Lucius and Gaius Caesar. The situation became more precarious in AD 2 with the death of Lucius. Augustus, with perhaps some pressure from Livia, allowed Tiberius to return to Rome as a private citizen and nothing more. In AD 4, Gaius was killed in Armenia, and Augustus had no other choice but to turn to Tiberius. 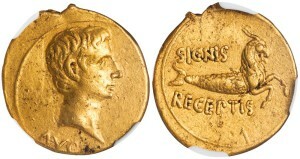 The death of Gaius in AD 4 initiated a flurry of activity in the household of Augustus. 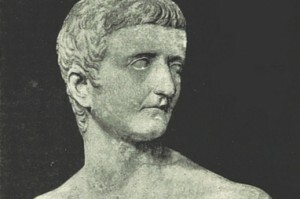 Tiberius was adopted as full son and heir and in turn, he was required to adopt his nephew, Germanicus, the son of his brother Drusus and Augustus’ niece Antonia Minor. Along with his adoption, Tiberius received tribunician power as well as a share of Augustus’s maius imperium, something that even Marcus Agrippa may never have had. 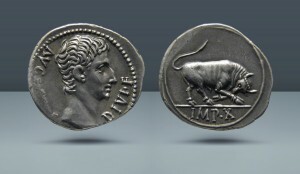 Thus, when in AD 13, the powers held by Tiberius were made equal, rather than second, to Augustus’s own powers, he was for all intents and purposes a “co-princeps” with Augustus, and, in the event of the latter’s death, would simply continue to rule without an interregnum or possible upheaval. Thus, according to Suetonius, these ceremonies and the declaration of his “co-princeps” took place in the year 12 AD, after Tiberius’ return from Germania. “But he was at once recalled, and finding Augustus in his last illness but still alive, he spent an entire day with him in private.” Augustus died in AD 14, a month before his 76th birthday. He was buried with all due ceremony and, as had been arranged beforehand, deified, his will read, and Tiberius, now a middle aged man at 55, was confirmed as his sole surviving heir. The Senate convened on 18 September, to validate Tiberius’s position as Princeps and, as it had done with Augustus before, extend the powers of the position to him. These proceedings are fully accounted by Tacitus. Tiberius already had the administrative and political powers of the Princeps, all he lacked were the titles—Augustus, Pater Patriae, and the Civic Crown (a crown made from laurel and oak, in honor of Augustus having saved the lives of Roman citizens).